The Greek Fisherman’s Cap or John Lennon Hat as it is often referred to, is associated with maritime vocations and situations. The Greek Fisherman’s Cap has become popular amongst the public in general, rather than staying isolated as just a fisherman’s hat. One example of the Greek Fisherman’s Cap being put into popular culture was when John Lennon started wearing one. Due to this the cap started to be referred to as the John Lennon Cap (or hat) and became the informal name that used in the mid 1960s to describe this style of cap. During the Beatles’ first tour of the United States in 1964, John Lennon wore a black Greek Fisherman’s Cap which quickly became popularly known as a ‘John Lennon Hat’. A similar style of headgear had already been worn by American singer and songwriter Bob Dylan in 1962. 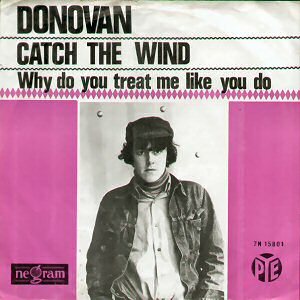 Others to adopt the fashion were the Beatles’ drummer Ringo Starr and British folk-rock artist Donovan (shown on the cover of his album Catch the Wind see above). This style of hat was usually made of denim, but also made of other fabrics such as corduroy. The style was re-created by actress Sienna Miller in the role of 1960s socialite Edie Sedgwick in the film Factory Girl in 2007.